« PREVIEWS STARTING at Forty Nine West Vancouver Oakridge Condos on the West Side close to the Canada Line SkyTrain! Things are looking UP! The UPTOWN Coquitlam condo high-rise is brought to you by leading developer BOSA Properties. The high-rise homes at the West Coquitlam UPTOWN condo development is complimented with a brand new grocery store as well on a strategic corner in this beautiful and growing city. Steps to the Evergreen SkyTrain Line and just minutes away from Simon Fraser University and Lougheed Town Centre, the BOSA UPTOWN Coquitlam condos are the best offering in the Tri-Cities real estate district this year! Stay tuned for more information. GRAND OPENING PROMOS: One Bedroom homes from $249,900 and Two Bedroom homes from $329,900! Plus, some VIP discounts include $7,000 off beds and $10,000 off 2 beds. Sub-PH is $15,000 and PH is $25,000 off for a limited time offer only! The new master planned West Coquitlam real estate project by BOSA called UPTOWN will consist of 450 homes in 2 signature high-rise towers. The first tower release is 26 stories in height including penthouse and sub-penthouse levels. The amenities at UPTOWN by Bosa Properties will include a complete wellness pavilion, including fitness facility with change rooms, a beautiful yoga studio, infrared sauna and steam room. Each of the UPTOWN Coquitlam condo towers will have their own private, stylish entertainment lounge space as well. The homes will also be very close to neighbourhood amenities in West Coquitlam including the Vancouver Golf Club, Burnaby Mountain, Como Lake as well as the Evergreen SkyTrain Station at Burquitlam. As well, the towers are minutes to Simon Fraser University and many top ranked schools for children of all ages. The West Coquitlam UPTOWN condo towers are situated at the corner of Como Lake and Clarke Road Coquitlam BC and there will be a new Safeway and Starbucks on the ground floor. Lougheed Town Centre is also very close by. The first tower presales start from just $258,000! The deposit structure includes 10% upon signing, 5% upon amendment to disclosure statement and 5% three months after the 2nd deposit. The preconstruction Coquitlam UPTOWN condo towers will be completed by winter 2016 (estimate). 2 initial floor plans have been released including Layout A which is a 1 bedroom at 549 square feet plus 72sf exterior. The second Coquitlam UPTOWN floor plan E is a 2 bedroom plus workstation at 828 sqft plus 130 sqft exterior space. Over the past months we’ve been putting the finishing details on our newest Sales Centre and designer model home, and we’re getting close to unveiling it to you! 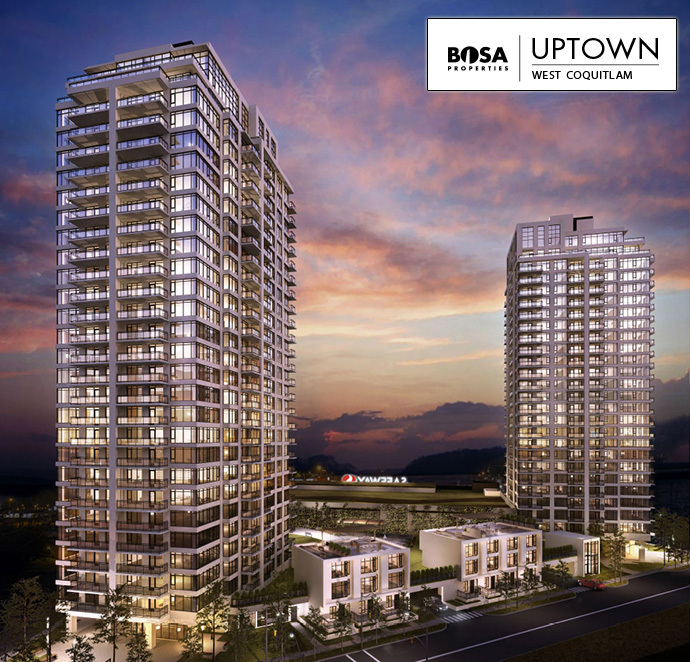 Uptown will offer beautiful new two bedroom and one bedrooms designs with legendary Bosa Properties’ finishes and details, priced from $258,900. West Coquiltam is well-positioned to be Metro Vancouver’s newest urban hotspot – a rapidly emerging location, revolutionized by the new Evergreen Skytrain line, walkable to an extensive range of stores, cafés, and amenities. Uptown is strategically located at Como Lake Avenue and Clarke Road, and will be the first new concrete highrise development in the neighbourhood. In the past few months, we have received an overwhelming response for Uptown. Located right next to a brand new Evergreen Line SkyTrain station, Uptown will have a brand new Safeway and is mere minutes from the many shops and services of Lougheed Town Centre. SFU is close by, as well as the parks and trails of Burnaby Mountain. Heading out? Reach Burnaby’s Metrotown in 15 minutes, and downtown Vancouver in less than 30 minutes. Uptown is truly at the centre of it all! Burquitlam Station will be a mere half block from Uptown, and rapid transit will get you to downtown Vancouver, YVR, Metrotown, or Surrey City Centre in no time. A new-concept Safeway and a Starbucks are at the base of the Uptown towers. When groceries are just an elevator ride away, your day becomes a whole lot easier. The new highly sought after Coquitlam UPTOWN Condos are priced affordably from $258,900! The project site of these truly affordable condominium residences is situated centrally at 580 Clarke Road Coquitlam. The UPTOWN Coquitlam condo tower will feature high-rise residences as well as a brand new grocery store at its base. Just steps away from the new Evergreen SkyTrain Line and just minutes away from SFU and Lougheed Town Centre will be a huge draw for home buyers and investors, giving you long term value in your property. Another great and attractive feature of this development is the fact that it is located in a truly transit oriented neighbourhood. Priority registration is already underway for the new West Coquitlam landmark tower at Uptown by Bosa. Located just steps away from the new Evergreen Skytrain Line, Uptown Coquitlam condo tower gives easy access to shopping at Lougheed Town Centre or the big box mecca at United Boulevard. Not only that, but there are lots of big box retailers, a diverse array of parks and outdoor recreation plus three advanced educational facilities nearby that includes Simon Fraser University, BCIT and Douglas College. 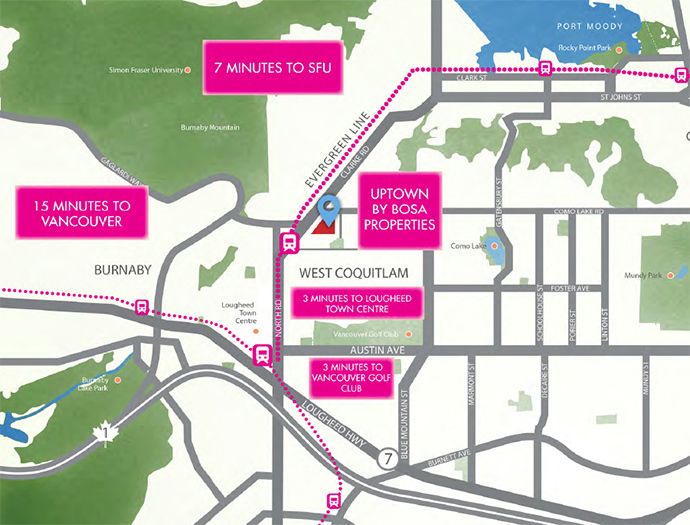 Visit www.bosaproperties.com to register for advanced information about the new West Coquitlam Uptown Condos for sale. It’s a momentous time for West Coquitlam. This central area is fast becoming the region’s next urban hotspot, revolutionized by the new Evergreen Line and a growing range of amenities. A key symbol of this transformation will be Uptown by Bosa Properties – two landmark towers on a strategic corner of West Coquitlam that will soon have everyone’s attention. TRANSIT. You’re steps from the new Evergreen Line, which means you’ll have effortless transit around the region right from home. GROCERIES. A new Safeway is part of Uptown’s base. When groceries are just an elevator ride away, your day becomes a whole lot easier. SHOPPING. Live 5 minutes from Lougheed Town Centre, which includes The Bay, H&M, Walmart, London Drugs and so much more. EDUCATION. Minutes to Simon Fraser University – voted Top Comprehensive University by Maclean’s magazine five years in a row! CONVENIENCE. Living at the corner of Como Lake Road and Clarke Road in West Coquitlam means being central to golf courses, rec centres and many more amenities. Sales start this Fall. Register now before the Evergreen Line is complete and the opportunity to get in early is gone.